If you can pay your unpaid taxes in full over time, the IRS will not accept an Offer in Compromise. In that event we may be able to negotiate an installment agreement with the IRS as a way to resolve your tax liability. If you are an individual that owes the IRS less than $25,000.00, the IRS can grant a streamlined installment agreement. The typical payment term of an installment agreement is five years. However, the IRS can also extend the term of an installment agreement to as long as seven years. If your liability is less than $25,000.00, you can choose to either make the payments manually (i.e., online or via a check) to the IRS where you are in control of the monthly payments. However, you are required to make the payments to the IRS on a monthly basis or you risk defaulting the installment agreement. Alternatively, you can ask the IRS to take the money from your bank account on a monthly basis via direct debit although you are not required to do so under this program. 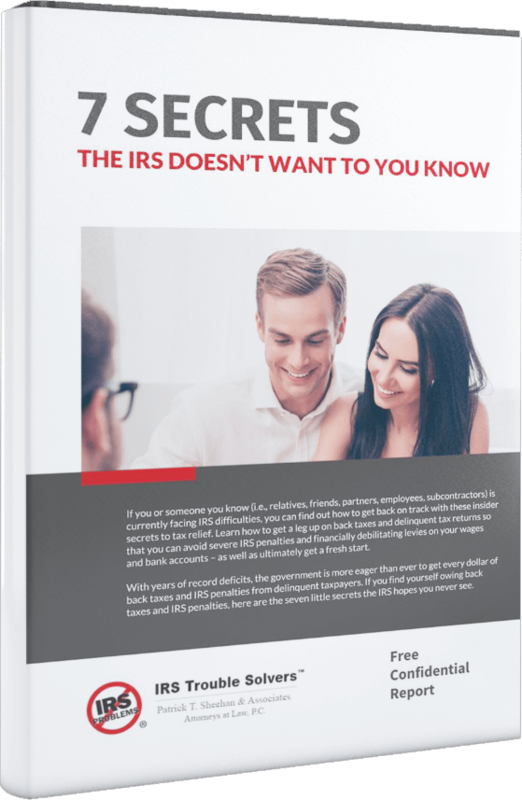 One benefit of this program is that you are not required to disclose your financial information to the IRS. If you are an individual that owes less than $50,000.00 to the IRS, you can apply for a direct debit streamlined installment agreement where the IRS automatically takes the payments out of your bank account on a monthly basis. Like the installment agreement discussed above, the typical term of an installment agreement under this program is five years. However, the IRS can extend the payments out as long as seven years. One benefit of this program is that you are not required to disclose your financial information to the IRS. Further, if a federal tax lien has non yet been filed, you can negotiate the non-filing of a federal tax lien as part of the installment agreement. If a federal tax lien has been filed, we can ask the IRS to withdraw the federal tax lien under certain circumstances. If you owe more than $50,000.00 to the IRS, the IRS will demand the filing of a financial statement, typically a Form 433A or Form 433F, Financial Statement. The IRS will review your ability to make payments to the IRS and will tell you the amount that it is willing to accept under an installment agreement. In that event, the IRS uses something called National Standards, a budget-based series of tables that determine the amount that the IRS thinks you should be paying for housing, food, clothing and transportation, etc. If the amount you pay on a monthly basis for any of these categories exceeds the amount the IRS thinks you should be paying based upon National Standards, the IRS disallows the difference and expects you to pay those funds to the IRS even though that money is not in your pocket. Worse yet, the IRS disallows unsecured payments such as credit cards even though you are still obligated to make those payments. If your business owes less than $25,000.00 in payroll taxes (federal Form 941 or Form 944), the IRS can grant an in-business Trust Fund Express installment agreement. However, the unpaid taxes must be paid in full within 24 months. If your business owes more than $25,000.00 to the IRS, the IRS will demand the filing of a financial statement, typically a Form 433B, Financial Statement. The IRS will also likely demand the filing of Forms 433A, Financial Statements, for the individuals that own and operate the business. The IRS will then review the business’ ability to make payments to the IRS under an installment agreement. Depending on the amount of the unpaid tax liability, the IRS may also propose to assert the Trust Fund Recovery Penalty against the owners, officers, directors, shareholders or other responsible individuals. The IRS will not grant an installment agreement unless and until you are in full compliance, meaning that all prior tax returns have been filed. The IRS will typically not grant an installment agreement to you if you have unfiled tax returns. While in an installment agreement, you must file all future tax returns when due and pay all of the associated unpaid taxes in full. Failure to do so will cause the IRS to default your installment agreement. What happens when you default on an existing installment agreement? It is possible that the IRS may be willing to reinstate the installment agreement. However, the IRS is typically less likely to grant another installment agreement when a prior installment agreement was defaulted. Further, the IRS will change the terms and conditions of the reinstated installment agreement, often by typically demanding more money from you on a monthly basis. What if I can’t pay the amount the IRS wants under an installment agreement? What if I can’t pay anything to the IRS on a monthly basis because I have no money?